The Hermann Oak Leather Company is one of the premier commercial tanneries remaining in the United States. Established in 1881 by Louis Charles Hermann to provide harness leather to wagon trains and settlers traveling west, Hermann Oak has maintained a tradition of producing high quality vegetable tanned leather. Businesses tend to flourish when a high quality product is provided at a fair price and Hermann Oak is no exception. As the company grew, Fred Hermann Sr. contracted with the US military to provide leather for our soldiers in both world wars. The company segued into more consumer based products after World War II with the help of Fred Jr. and Hermann Oak today is captained by Shep Hermann, who is one of the most gracious business men I have had the opportunity of speaking to. Shep gladly provided several hides for Best Leather to review and work with. We posted our first review on their Sierra Latigo line of leather several months ago, and in this review, we’ll look at their English Bridle line of leather. We will also be looking at their Harness leather in a future review. Hermann Oak specializes in vegetable tanned leather. With the vast majority of leather being chrome tanned, vegetable tanning is almost becoming a lost art form. Hermann Oak is keeping this tradition of tanning leather using tree barks and other natural ingredients alive and well. The benefits of a vegetable tanned hide are many and varied. Vegetable tanned leather takes a patina, whereas chrome tanned leather does not. Patina is what gives high quality leather its distinctive look and what makes a bag or wallet look better with age. Another significant benefit in our more environmentally conscious world is that vegetable tanning is significantly more eco friendly than chrome tanning, and it also results in a product that is moldable, than you can carve and make beautiful patterns in, and that has a slightly stiffer hand. Vegetable tanned leather also absorbs moisture better which allows the dye color to more fully saturate the leather and form a tighter chemical bond. Chrome tanned leather is essentially painted or pigmented with color, resulting in a product that has less color saturation. For this review, we took the English Bridle hide that Hermann Oak sent us and crafted a large bag (approximately 16″ Wide by 12″ High by 8″ Deep) to show some of the properties and beauties of this leather. The leather provided was thick, approximately 9 ounces so, and was a pleasure to work with. Vegetable tanned leather is stiffer than chrome tanned leather, but I found this a benefit when working on this bag. Adding a slight burnish to some of the edges was a breeze and punching holes by hand and weaving the waxed polyester thread through them was a snap with the firm leather. The chestnut color that Hermann Oak uses is beautiful as well. It has an earthy tone and marries well with the natural brown color on exposed edges of the leather. You can also get Hermann Oak’s English Bridle leather in black, British brown or havana. Most of Hermann Oak’s leathers are not struck through, meaning that the dyes are not impregnated to the middle of the leather. This can be an issue to some consumer good producers, but many bag makers will hand dye or hand paint the edges of the leather to give it a more finished look. This is a small tradeoff for using a thicker, finer, and more substantial leather that is bound to outlast most people. I found that this step was unnecessary with the chestnut color for our project, especially when you burnish the edges, with the finished product looking handsome. English Bridle leather has a characteristic smooth finish with a hint of a waxy feel. As the name implies, the leather was originally made for horse bridles and as a result, did not need to contain a significant amount of wax to perform effectively. Unlike harness leather, which is impregnated with more wax to better withstand the elements, English Bridle has slightly less wax, which still helps it to be weather resistant, but is a little drier. Their Latigo line is slightly drier still, which is characteristic of Latigo in general. The underside of the English Bridle hide is also quite smooth, not nearly as much as the finished outer side of course, but smooth enough that I felt adding a liner to the bag was not necessary. Unlike certain leathers that fray or have a lot of loose fibers on the underside, this is not the case with Hermann Oaks English Bridle, which made for a nice finish on the interior of this bag. 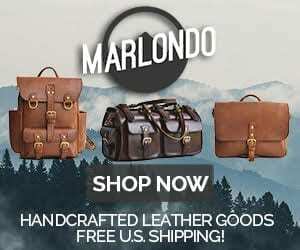 You can order directly through Hermann Oak if you have a large enough order (typically five sides or more), or for smaller orders you can order through one of their distributors, such as Weaver Leather or Tandy. Their customer service is excellent and they have a high knowledge of their leather and the leather industry in general. Shep Hermann himself leads the effort of being leathercated, and takes pride in knowing and understanding the history of leather, being current on new technologies and practices, but still maintaining the art and craft of days gone by. The Hermann Oak Leather Company produces some of the finest vegetable tanned leather in the world. Period. Their English Bridle line of leather is smooth, has a slight waxy finish to it, is substantial in feel and is excellent to work with. And it is beautiful to boot. 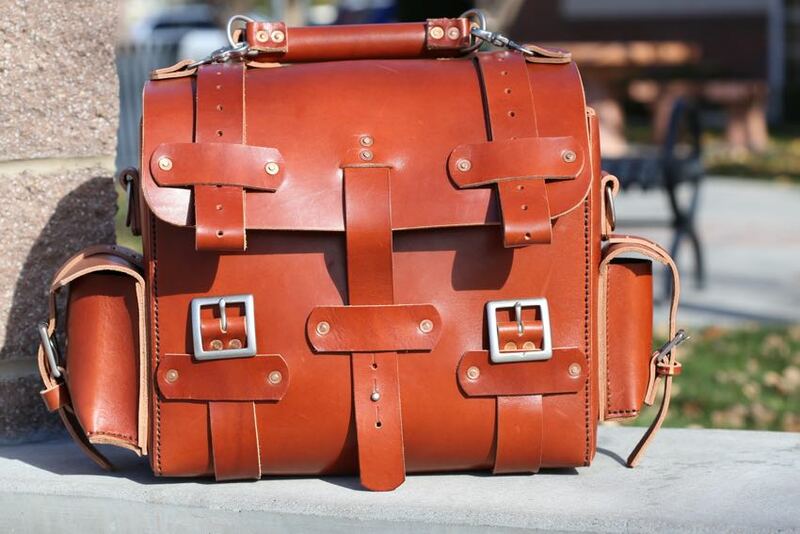 A bag was produced from their English Bridle leather that will outlast the bag’s craftsman, but that hopefully his sons will use on many adventures of their own. If you are in the market for some exceptional veg tanned leather, look no further than Hermann Oak. I have a passion for high quality leather goods. That passion stems from the love of beautifully tanned leather crafted expertly to last a lifetime. I am happily married to my gorgeous wife and four lovable children. My trade is a mortgage broker and a have a shop in Meridian, Idaho.